Industrial-style coffee roaster and café, and lots of passion for creating perfect coffee in all styles. 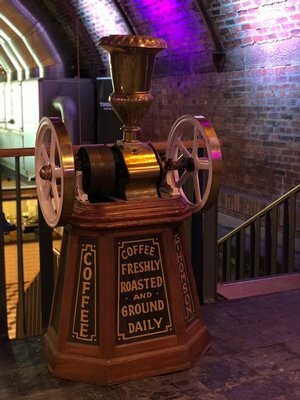 It is great to see the Arches space revived with the help of Thomson’s Coffee Roasters – Glasgow’s oldest coffee company, established in 1841 – which now occupies the former basement café. The Argyle St Arches (to give it its Sunday name) is already the venue for the Platform street food gathering so the addition of Thomson’s adds to its appeal as an all-weather weekend hangout. The basement space has had a spruce up but the air ducts are still exposed – providing a stylish industrial feel. Food-wise there are mac and cheese and egg skillets, pizzas and comforting cakes. But coffee, in its myriad styles, is king and every cup provides a new insight. Just ask a question and the barista will be happy to oblige. Still in development at spring 2018, the plan is to introduce a huge roaster, a tasting room, tours and tutorials to create the coffee equivalent of a craft brewery or distillery.